By hungry runner on May 31st, 2011 . Filed under: Cupcake Ideas . 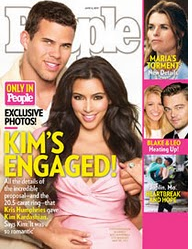 The June 6, 2011 issue of People magazine features Kim Kardashian on the cover but it’s what’s inside that matters to cupcake fans. The issue’s Food Trend section is all about Savory Cupcakes and celebrities that enjoy them. According to the article Rachel Bilson is a fan of Tomato Soup Cupcakes from Yummy Cupcakes. Rachel Ray also happens to be a fan of Yummy Cupcakes. Chicago’s More Cupcake’s Bacon Maple Cupcake has made Oprah’s O List. Tom Pizzica of the Food Network likes Lox Cupcakes from It’s a Cupcake in Philadelphia. Yes, you read that correctly, lox cupcake as in smoked salmon cupcake. Candace Nelson, judge on Food Network’s Cupcake Wars has been spotted eating Sprinkle’s Cupcake’s salted caramel cupcake. I would definitely try the salted caramel and am intrigued by the tomato soup cupcake which I’ve never heard of before but lox might be too extreme for me. 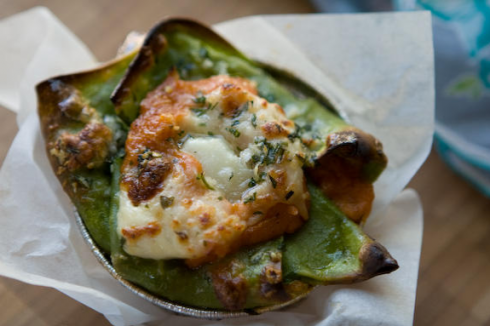 The magazine also shares a Smoked Mac-N-Cheese Lasagna Cupcake recipe from L.A.’s Heirloom L.A. catering company. Have you tried any savory cupcakes from your favorite cupcake shop? Or have you attempted baking your own savory cupcakes? Why not whip up a batch yourself with these savory cupcake recipes that we’ve shared with you in the past; like the Cheddar Chive and Bacon Cupfakes with avocado frosting or Beer, Cheese, Bacon and Cream Cheese Cupcakes. « This Giveaway is Sew Lovely!